Flowers and pastel colors are a perfect match. This year no yellow and green decoration which is the most classical color combination you can think of for Easter. Keep it joyful, such as an Easter celebration should be. It is a moment of joy, being thankful and finding peace in the hectic of every day. Putting flowers in a vase is for sure an easy way to bring spring inside the home, but now that we celebrate Easter we can think of making an Easter wreath. Normally we think of Christmas when making a wreath but it is such a beautiful habit that we should also do it for other celebrations in the year. 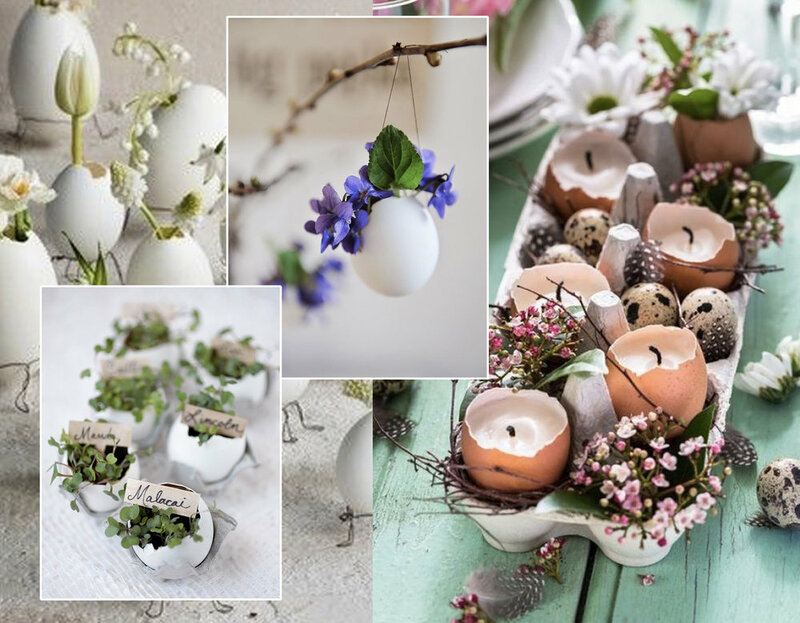 You can go for the classical round shape, but why not creating Easter in letters with branches and adding some flowers, it will get a very creative decoration on the wall. 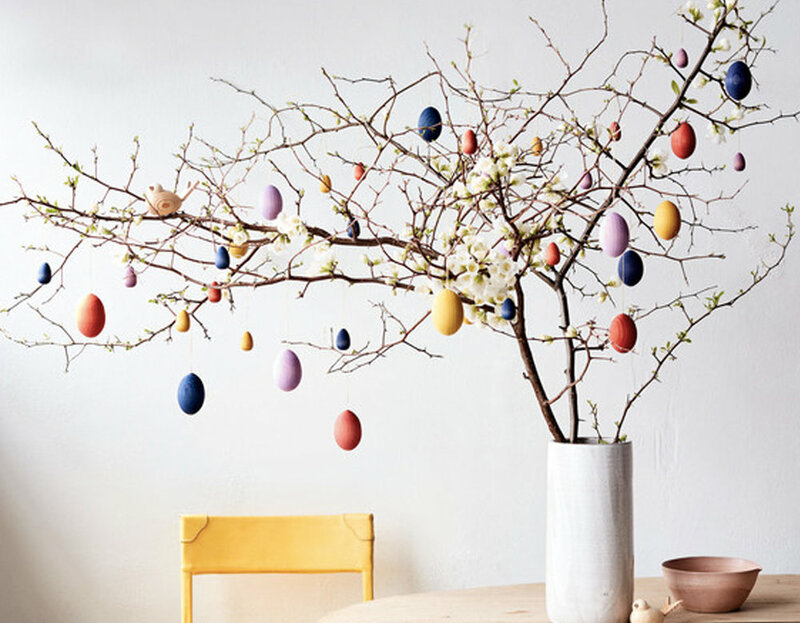 Decorating this Easter egg tree will be a fun activity to do with the whole family. I can guarantee you everybody will be relaxed by the end of the day. Paper eggs done with some scrap paper, small egg shell vases. Take a look what you have already in the house, be creative with what you have. Think of a color harmony, it can be all white, pastel colors or make it bold if your kids love a lot of color. When we think of Easter we think of eggs. Chocolate eggs, eggs for breakfast, dishes prepared with eggs. Some culture will have different traditions. It is the moment to dye the eggs, if possible with plants and vegetables as the colors and the effects are much more beautiful and natural. Maybe you are more organized and are getting prepared for Easter in time and you started collecting some egg shells a time ago. So you will be ready to fill them with wax for candles, or you started putting some seeds in soil and some green leaves are popping out or you could use them as small vases on the table. Combine the big eggs with some smaller eggs, colored, chocolate eggs, and small flowers to create an amazing center piece for the table. Keep the table decoration simple, pastel colors and flowers will do it all. Linen napkins in white or light pastel colors, a small ribbon to keep the cutlery in place. Don’t forget it is more about being together and celebrating Easter than having the perfect table setting. If Easter is also a moment for you to give gifts to your loved ones? Green leaves, pastel colors, flowers, a nice piece of linen, a simple ribbon will make your gift stand out. Keep also here the colors light, a simple white paper is the perfect base to start working with. I love to wrap gifts with fabric, it is also a no-waste solution and you can use the fabrics allover again. Eggs in nests or baskets you can put all around the house. 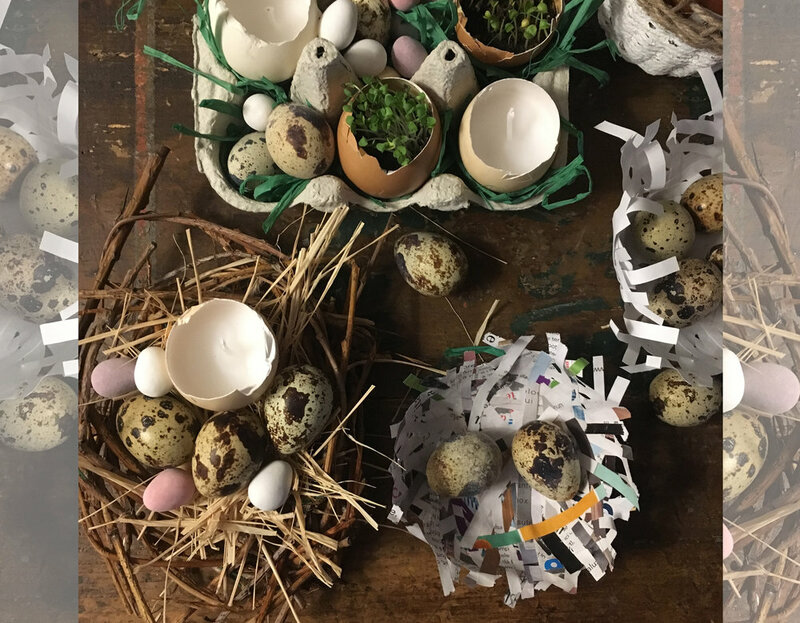 During the weekend workshop in Balaban a few weeks ago we made different ones: in paper, with branches, using the carton package of the eggs. Make it a weekend with nice activities for the whole family. Let the weekend be filled with peace, joy and bring people together. Happy Easter to all of you, enjoy this moment with friends and family.